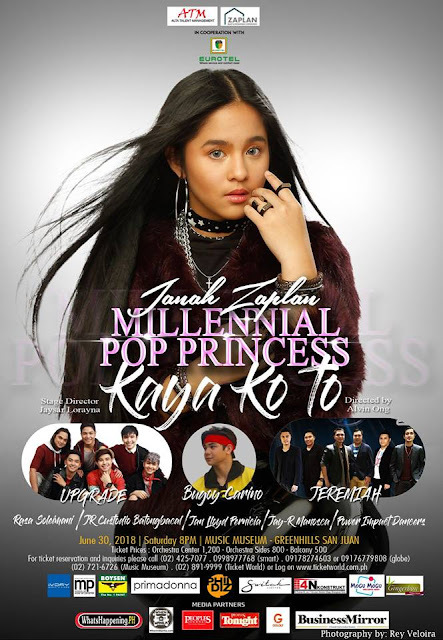 The Millennial Pop Princess Janah Zaplan is gearing up for her launching concert, Kaya Ko ‘To, which will be held at the Music Museum at Greenhills, San Juan on June 30, 2018 (8:00 pm). Contrary to her popular song, "Di Ko Na Kaya," Janah is full of excitement and verve as she prepares to showcase her talents together with special guests: 2017 Promising Teen Boy band, UPGRADE; together with popular 90’s boyband, JEREMIAH, and with the special participation of It's Showtime's Hashtag member, Bugoy Carino, plus other exciting guest performers. 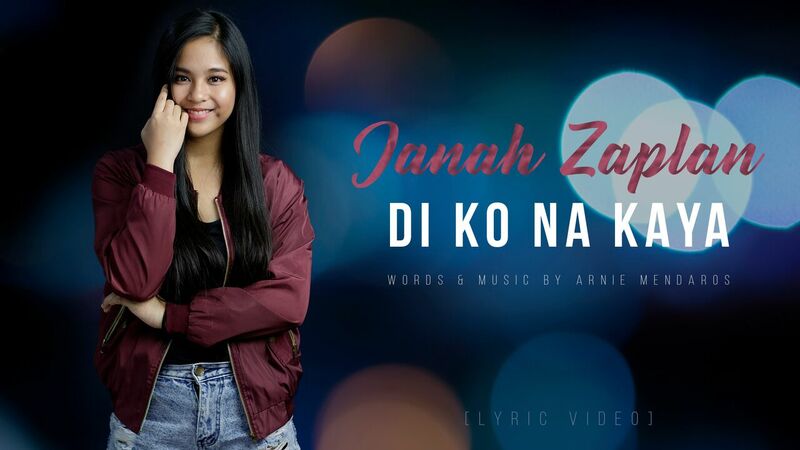 Janah Kristine Platon Zaplan, she introduces herself in a very faintly sweet husky voice that is so refreshing, it reminds you of Moira dela Torre or even Dua Lipa, who incidentally are idols to this pretty gal. Indeed, this youngest in a brood of four girls, has both her feet flat on the ground that you will never see the slightest hint of being a spoiled bratinella. 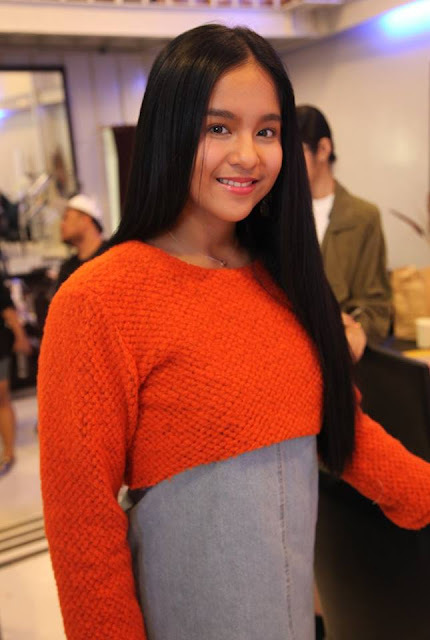 She says that even with her rising fame from her accomplishments, she enjoys no preferential treatment, except for the occasional “Lodi!” shouts from friends and schoolmates. Janah, unlike any teenager, prefers black over pink and lavender, because “black is elegant and makes you look slimmer,” she says. Her favorite dish is adobo because of the sweet and sour flavor. She may be sweet in person but when she’s onstage, she’s a fierce performer! She’s moving up to Grade 11 under the General Academic Strand because she says it is an “all-in” strand. She wants to become a pilot because she wants to fly away and travel with her family. Traveling with the family is so important to her as they love exploring new places and making memories together. Daddy still brings Janah to school which she enjoys because she gets to have a “me and dad time.” She still sometimes sleeps in her parents' room -- her comfort zone, her oasis of strength. Janah is a member of the varsity team of OB Montessori Center, playing volleyball like one of her idols, Alyssa Valdez. Playing volley, according to Janah, gives her the same high as she tries to reach the notes when she sings. The discipline of concentrating on the volleyball court is similar to that when concentrating on the proper notes of a song. The strength she gets from the sport blends well with the grace and rhythm from music. She says teamwork is important, the discipline she gets helps her when she’s alone because it makes her feel that even when she performs alone sans her team, they still got her back. Her team supports her well. This pretty girl is an alumna of G Force Dance Workshop under teacher Georcelle, so she knows what she does when she performs. Janah is not new to performing to a large audience. She was a quarterfinalist in "Music Hero: The Vocal Battle" in the longest running noontime show, Eat Bulaga. Her entry piece then was "Scared to be Lonely" by Dua Lipa. She landed a spot in the quarterfinals where she sang "Time In" by Yeng Constantino. With talents in singing and dancing, Janah can perform songs popularized by Moira and Dua Lipa whose songs fit her vocal range to tee, all of them having that husky cool voice that somehow swings your mood from low to high in a snap. She also admires Beyonce. One thing most people do not know of Janah is her charity works. She has done a couple of charitable endeavors which makes her charming and lovable to many people whom ordinary individuals fail to give attention to. Just recently, she and her family hosted a small program for cancer patients/victims. People afflicted with cancer are really close to her heart as her mother is a cancer survivor. She spent time making them happy with songs and simple gifts from the heart. Janah and other artists under the same talent management group went to Mindoro to give aid to the Mangyans, providing them with television sets which they will use for interactive school programs, with toys and clothes as well.